This is a collaborative project between academic Susy Menis and artists Noriko Hisazumi and Fabiana Vigna. The artwork in A History of Women’s Prisons: an artwork exhibition draws upon historical criminological research on the reform of the prisoner during nineteenth-century England. The artwork focuses on the emotional tension between the penal aim of reformation and the effects it may have had on the prisoner. The main aim of the project is to problematised imprisonment through visual representation. The artwork exhibition creates a platform for discussion concerning social justice. Set in the evocative and atmospheric Crypt Gallery, it brings to life intangible sensations- the exhibition space becomes a site for reflection. 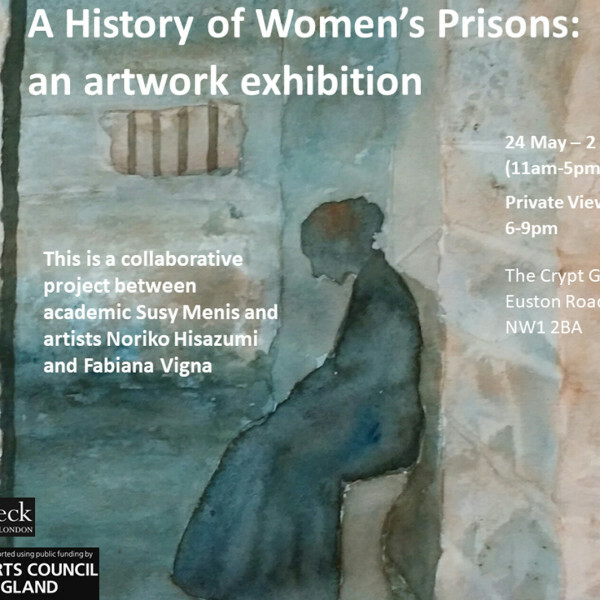 The artwork draws upon Susy’s research ‘A History of Women’s Prisons: The Myth of Reformation’. At the core of this research is the question of ‘prisoners’ reformation’. The study explores the experimental nature of the prison penalty, and its subsequent state of crisis. The crisis reflects the clash between what was conceptualised in penal discourse as desirable prison policy and prison regime, against the actual implementation and implications of such a penalty on the prisoner. Despite this crisis, however, the prison system has become firmly embedded in the fabric of society. Prison discourses have developed the understanding that ‘reformation’ stands for the process through which the prisoner is rehabilitated or ‘untrained’ from her criminal or deviant tendencies, thus facilitating social integration as a ‘new’ law-abiding citizen. However, ‘reformation of the prisoner’ is a myth. Historical examination reveals that although ‘reformation’ became one of the core aims of imprisonment, its implementation has been almost impractical.